Zappia Racing head to Fuchs South Coast Raceway in Victoria to compete in Round 2 of the Slamfest, after a strong performance at the Top Fuel meeting at Perth Motorplex last weekend. “We managed a respectable 5.85 @ 249.00mph in the first eliminator” said an enthusiastic Zappia, “We missed out on a B Final by 0.013 seconds, and the weekend was testing for many teams as the track was a little difficult in the conditions”. 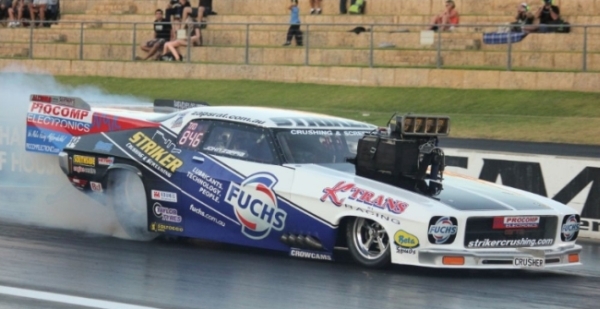 “First pass on the Friday night in Top Comp saw the Fuchs Lubricants / Striker Crushing Monaro overpower the track. We are making plenty of power with this combo, and I had to pedal and get back on it and drive it out the back door so we could get some data. A 6.037 @ 245.23mph – pretty good speed there”. “Second pass we made some changes to the car to try and get her through the middle part of the track, but again I overpowered, had to pedal and get back on. 5.973 @ 248.61mph got us 7th in the field in a 19 car field – 0.287 under our index”. Overnight the Zappia Racing crew serviced the Crusher, and made preparations for the next round of racing. The Top Comp bracket in Perth finds the four winning racers of the first round who are furthest under their index meeting up in an A Final, and B Final. “I looked very hard at all our data, did some serious thinking and discussions with the crew on how to get the car down the track. If we managed a 5.80 we reckon we were in with a chance for the final”. “I pulled a killer 0.009 start light and the Fuchs Lubricants / Striker Crushing Monaro just hauled straight down the groove and set the timers off at 5.859 @ 247.25mph – 0.401 seconds under our index. Just not enough to get a finals berth”. “We pack the Zappia Racing Transporter up and head off to Fuchs South Coast Raceway this week for Round 2 of the Slamfest to be held on 15th – 15th Feb 2013. I am keen to make up for last year where my old mate Victor Bray put me on the trailer in Round 1. We are second in the points, and I am keen to put in a good eighth mile performance. “. “The start line is killer down there, but the transition to asphalt caught a few racers out last time. With a little hindsight and data behind us, we should be able to get down quickly”. Fans can tune into Facebook and Twitter for regular updates during the meeting.